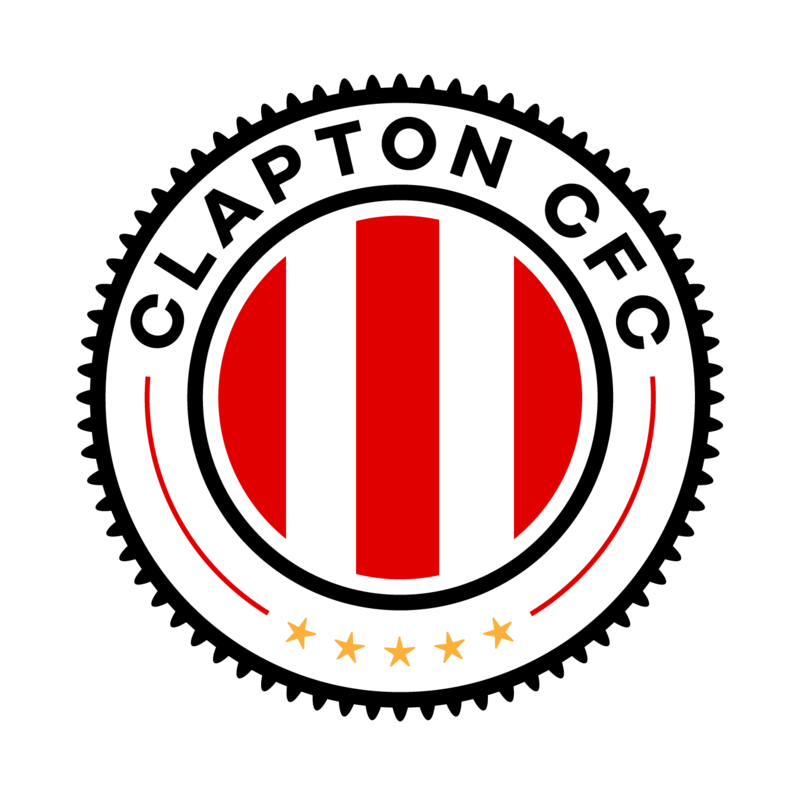 Fans came from near and far to see Clapton’s historic overseas friendly with CE Júpiter. There were those who had followed from East London. There were familiar faces from the Clapton Ultras days who now live in the area. As a pleasant surprise, there were also a couple of Sant Miquel players, a three-hour round trip away. One of them was the defender who had scored a spectacular own goal at the Stray Dog in our friendly the day before. He is a CCFC cult hero now. But even more so, there were the new fans who had been brought on board by the buzz surrounding the International Brigades-inspired away shirt and the values the club wants to defend. All in all, by our estimation around 700 to 800 people descended on the Sant Martí district in the Northeast of Barcelona for this centrepiece event of the Primavera Republicana festival. One of them was the deputy mayor of Barcelona. And Júpiter’s Verneda stadium, with its large grandstand and three sides of terracing was an impressive setting. Quite the contrast to the bare scrubland on which the Tons had taken on Hereford Palace two days earlier. Some Clapton fans arrived at the stadium about an hour before kick off. They were given a whistlestop tour of Júpiter’s amazing trophy room and archives. including match reports from clashes with Barcelona and Español over a hundred years ago. All the while, a club photographer enthusiastically snapped the fans gawping at the trophies, photos and old documents. It turned out these fans had been mistaken for players. Barcelona City Council officials, who had organised the occasion, were particularly concerned that the visiting team were drinking and smoking before the match. But then the real Clapton squad arrived and the confusion was cleared up. A long queue materialised where some Clapton away shirts went on sale. There was the now familiar sight of Geoff Ocran holding court with the media scrum. Then there were some official presentations and exchanges of gifts with dignitaries. In preparation for this, Júpiter had asked us who our club president was and what our club hymn was, but we don’t have those things! Tom Carding was among the players taking to the field for the third time in this action-packed weekend. Ellick Coleman deputised at left-back in the absence of Liam Smyth. Daniel Mbaku made his debut between the sticks. The Tons nearly had a dream start. A Stefan Kilron corner from the left was floated into the box. In the penalty box melee, it struck Júpiter’s player’s hand. Spot kick to the Tons. Sherwin Stanley stepped up, but going for an emphatic finish he fired over the bar. 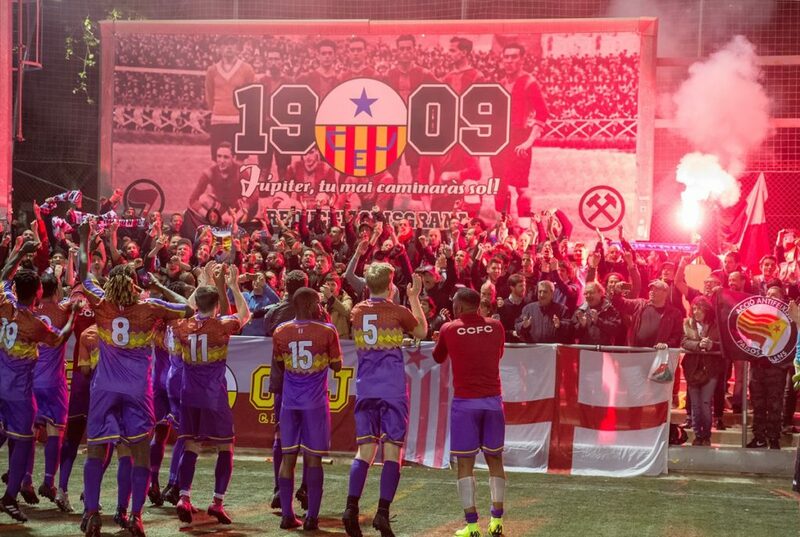 Even if the Catalans had gone on to score ten, even if it had just been a ‘pre-emptive consolation’, it would have been nice to see Júpiter 0-1 Clapton in the gigantic electric scoreboard. Would have been a photo opportunity. Júpiter, in their distinctive grey and plum striped kit looked a tremendous team. Their lightning pace down the wings was keeping the Tons backline on their toes. And they took the lead with a beautiful shot into the top corner from outside the box. 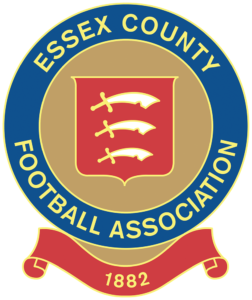 For the rest of the first half, Clapton defended resolutely, not permitting too many chances. That said, they were unable to lay a glove on their hosts at the other end. The visiting fans stood with the Reducte GrisGrana ultras. The Júpiterites let the Claptonites sing a song. The Claptonites let the Júpiterites sing a song. And so on. For the simpler numbers, both sets of fans sang together. As the game wore on, Júpiter wore down their already travel-weary opponents. In the second half, the goals started to trickle then flood in. Strikes on 51, 57, 69 and 72 gave them a 5-0 lead. As usual, Eliot Crosbie battled hard in the middle of the park and Josh Adejokun gave an out ball down the right. But Júpiter were well-drilled enough to break up any Clapton attacks. After the final whistle, both sets of players came over for a sing-song with the fans. The chant of ‘no pasarán, no pasarán’ boomed out of the smoke and fiery glow of the stand. The players could be proud to have kept in the game for so long against opponents from the fifth tier of Spanish football. Despite defeats in their two friendlies, by a combined 11-2, the Tons will go into Saturday’s Jim Rogers Cup final against Hilltop with a strengthened team spirit. They will surely also have enjoyed a couple of days to rest their legs. The final words must go to our hosts. Barcelona City Council, for inviting us to their fantastic annual festival keeping the spirit of the Spanish Republic alive. For the CE Júpiter officials, players, supporters and ultras who embraced a Monday night fixture with as much enthusiasm as their visitors. If you’ve ever visiting Barca, check out their fixture list, you won’t regret it. To all the friends old and new, no pasaran!